The Elkay EZS8L Water Cooler is a self-contained, wall hung electric refrigerated unit. Chilling capacity of 50°F drinking water, based upon 80°F inlet water and 90°F ambient. The Elkay EZS8L has self-closing Easy-Touch Controls on front and both right and left sides and a hooded stream projector with Easy-Touch Controls that require less than 3 pounds of force to activate. The Elkay EZS8L has a patented* valve with built-in flow regulator provide constant stream from 20 to 105 psi, water pressure. Bubbler orifice fully protected to meet all sanitary codes. Non-pressurized stainless steel cooling tank is standard. Non-pressurized water tank is located after bubbler valve, so that tank is subject to line pressure only when Easy-Touch Control is pressed. The Elkay EZS8L complies with the requirements of A.D.A. (Americans with Disabilities Act) when properly installed. Also meets the guidelines for children’s environments providing the floor to orifice height is 30" or less and proper clear floor space is provided for parallel approach. (Based on Architectural and Transportation Barriers Compliance Board final ruling.) Check Local and State Codes. 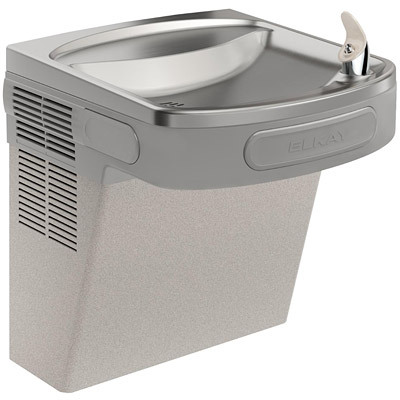 The Elkay EZS8L is certified to be lead-free as defined by the Safe Drinking Water Act. Elkay Water Coolers are manufactured with a waterway system utilizing copper components and completely lead-free materials. These waterways have no lead because all lead materials, such as leaded brass, have been removed. All joints are brazed using silver solder only. No lead solder is permitted. A strainer with an easily cleanable screen is provided to allow trapping and convenient removal of waterborne particulate of 140 microns and larger prior to their entry into the water cooler. This was a replacement in our church. It was fit in the same location as the old one and fit without any wall openings. Thanks for the quick shipment for a competitive price. We bought these as replacements for the same models which have been well used for many years. They were able to be mounted in the same area so no modification was needed for plumbing or cosmetics. They are simple to install and the first units had over a decade of service.